Practicing specific procedures for pre-finishing and polishing of 950 palladium will make a stunning difference in the final presentation of this fine jewelry product. This 950 Pd wedding band design was made using CAD/CAM design and model making technology and features high millgrained edges, textured diagonal grooves and a high polished flat surface. 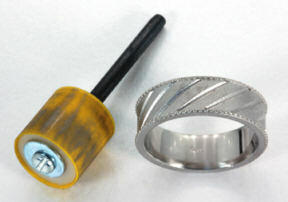 The ring was finished from a rough casting using a progressive abrasive system and limited standard polishing techniques. The pre-finishing and polishing system featured in this article can also be used after sizing any 950 Pd ring. 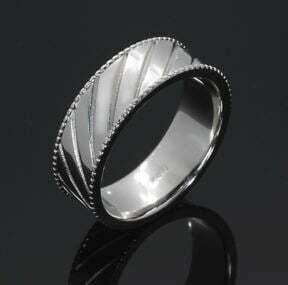 The model for this ring was milled in carving wax and then cast in 950Pd. 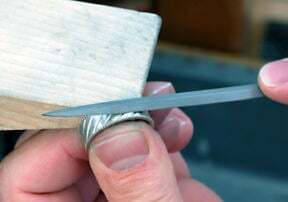 The gates made in preparation for the casting process were attached to the inside of the ring shank and ground away after separating them from the model. The granular surface seen on this rough casting is the result of the investment molding and casting process. To begin the process of pre-finishing, sanding drums were made using Foredom’s drum mandrels and an overlay of 3M’s Imperial Lapping Film. The lapping film is supplied in PSA adhesive backed sheets measuring 8 1/2 x 11 inches and is 3 mils thick. The drum portion of the mandrel measures 13 millimeters in length by 12.5 millimeters in diameter and is made of hard Teflon-like material. The shanks come in 2 diameters, 1/8 or 1/32 inches. To make the drums, the lapping film was cut into 13 millimeter strips and the backing removed. The abrasive film was simply wrapped around the drum of the mandrel as shown. Tip: 3M’s Imperial Lapping Film can be used wet or dry. It features micro grain particles of high grade aluminum oxide that is applied through a special coating process. The result is a fine, consistently distributed abrasive surface that leaves an almost burnished look on the metal, rather than the deep indentations characteristic of typical abrasive papers. There are 6 grits of abrasives in this progressive system. They range from 320 to 8,000 grit. The blue 320 grit shown in this image has removed the majority of grinding marks left by the coarse removal of the casting gates. 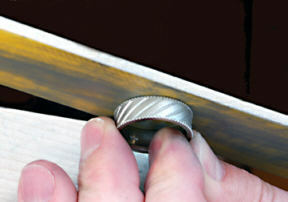 The abrasive technique requires light pressure between the ring shank and the drum mandrel while using a rounding, back-and-forth motion. Tip: When using a progressive abrasive technique, the best results are achieved by using all grits in the system. Doing so will not only shorten the time required to complete the overall process, but will prolong the life of the abrasive film. The green 400 grit was used as the second step after the blue 320 grit. Next, the yellow 650 grit was used leaving a semi-lustrous abrasion-free surface inside the shank. Step 4 calls for the light blue 1200 grit drum. 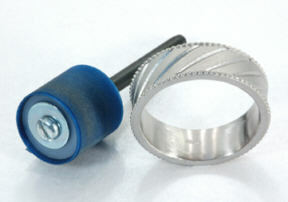 The abrasive drums are stored in a bur holder making them easily accessible. The holder is numbered correspondingly with the grits, helping to keep them in progressive order. Step 5 and 6 (pink 4,000 and lime green 8,000 grits) were completed and the inside of the shank is now smooth, with a high luster. NO polishing compound was used prior this final pre-finishing step and only the use of rouge will be required to complete the process. 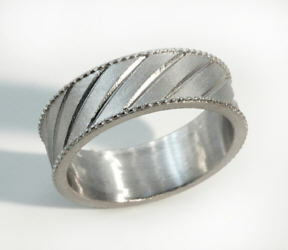 With the inside of the ring completed, the sides are next. The same progressive procedure will be used. 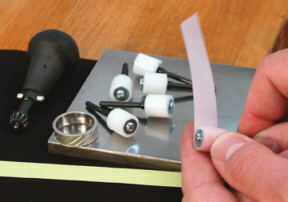 The abrasive film is cut to fit a standard size sanding stick, the PSA backing removed and the film is then applied to the stick. Tip: Use cross sanding techniques. 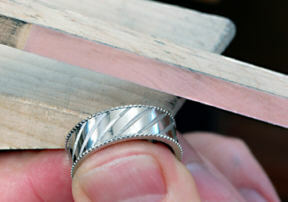 Hold the ring so the sanding can be accomplished in one direction and then turn the ring and sand again. Cross sanding techniques insure flatter surfaces. With both sides of the ring now completed, the central flat portion is next. 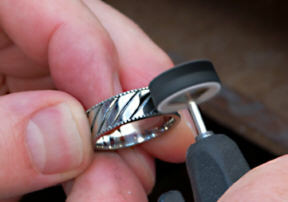 This part of the process begins with burnish filing. The technique of burnish filing calls for a fine cut file (a No. 6 barrette in this case) to be used with forward and backward motion. Usually, filing is done only in the forward direction to cut and remove metal. By dragging the file backwards, the metal is burnished making it smoother. 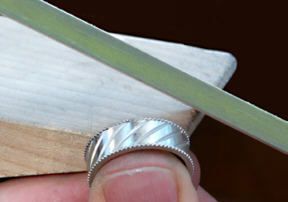 The width of the ring between the raised millgrain pattern is 8 millimeters. 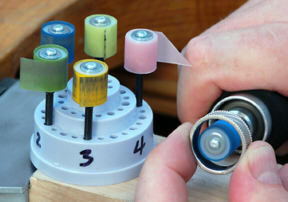 A sanding stick is custom cut to an 8 millimeter width and the film is applied. Step 5 in the process, pink 4,000 grit begins to yield a flat polished surface. There’s one more step prior to polishing. The pre-finishing is completed with the six-step abrasive film and the process has taken the metal from granular to a flat luster appearing polished. 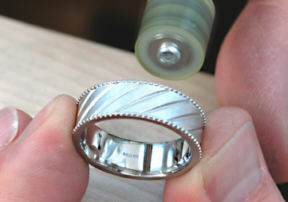 The band was then polished with white 4,000 grit polishing rouge and followed by using 8,000 grit white rouge. Inside ring polishing buffs were used for polishing the inside of the ring, a medium felt lap was used for the sides and a medium/hard felt lap was used for the top flat surface between the raised millgrain edges. A loose stitched buff was used to give the 950 Pd its luxurious and unmistakable final bright white luster. Palladium, like platinum is used in a pure form and is most often alloyed with other platinum group metals like ruthenium. The specific gravity of palladium is similar to white gold and almost half of platinum allowing for bold, expressive design concepts with the luxurious rich look of this lighter, brighter metal. Palladium is naturally bright white and therefore does not require repeated rhodium plating to keep the finished piece white during normal wear. Pre-finishing and polishing palladium requires fewer steps than platinum. Palladium, like platinum is hypo-allergenic. Palladium is malleable and has little or no memory, an advantage for dead-setting of gemstones, hand forming and design fabrication. Luxury jewelry designers have discovered the versatility and classic appeal of palladium to be elemental in the creation of their finest gemstone suites and one-of-a-kind pieces. All rights reserved internationally. Copyright © Mark Mann. Users have permission to download the information and share it as long as no money is made. No commercial use of this information is allowed without permission in writing from Mark Mann. This article was first published in Jewelers Circular Keystone magazine. Palladium Alliance International (PAI) was founded in 2006 and is dedicated to providing palladium related sales and technical manufacturing information to the industry and consumers.